I have chosen Rose's Lime cordial - an ingredient I have never mixed with, and I can't really say I have been daydreaming about it either. However the lime cordial is part of the history of the Gimlet and so I secured a bottle of the light green stuff. And then I chose Raymond Chandler to be my guide and use the ratio he heralds in The Long Goodbye: We sat in a corner of the bar at Victor's and drank gimlets. "They don't know how to make them here," he said. "What they call a gimlet is just some lime or lemon juice and gin with a dash of sugar and bitters. A real gimlet is half gin and half Rose's Lime Juice and nothing else. It beats martinis hollow." I believe many would suggest mixing with Plymouth Gin for the cocktails connection to the British Navy and the curative mix of lime and gin that kept the sailors from getting scurvy. 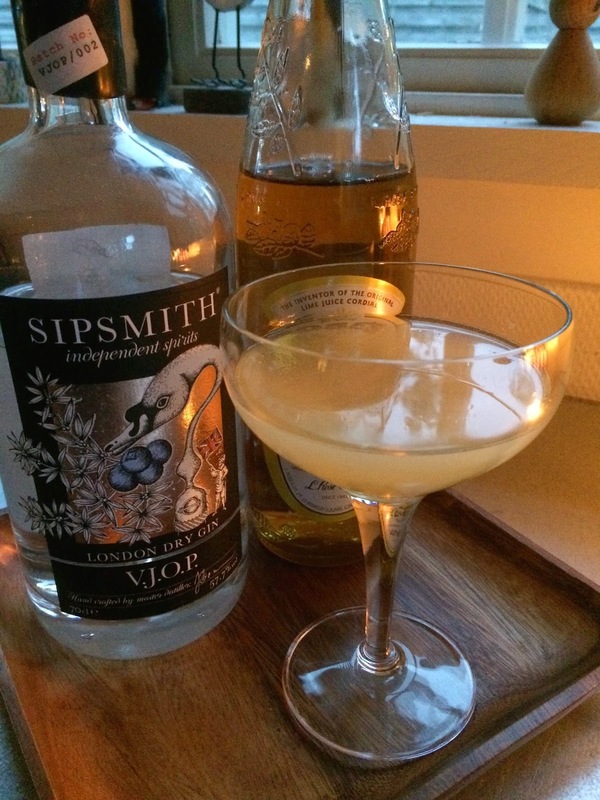 I chose a Sipsmith VJOP in stead for the generous amount of both juniper and alcohol - thinking that might even be a more authentic gin taste from way back when the mix of lime and gin did not have a fancy name and was not written up in cocktail books. But I'm not sure if it is the 1:1 ratio or the choice of gin that let's this particular drink down - it's just not a nice taste. The decidedly synthetic taste from the lime cordial catches on the strong juniper flavor of the gin and leaves you with a taste of cough syrup and unwashed underwear. So I think it's safe to say - I've bought my first and my last bottle of Rose's Lime.